Typical Christmas cake from Valtellina, a valley along the northern border with Switzerland; rich in dried fruits is a very wonder of the rustic cooking. Try it, for Christmas or simply for a breakfast Italian style. 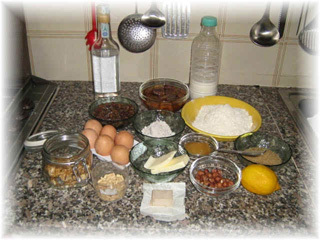 Notes to the recipe: Bisciola is made with dried and candied fruits, as many Christmas cakes. All the ingredients are easy to find. The only ingredient typical Italian and of all Alpine areas is Grappa, distilled from wine produced by extracting the alcohol from vinacce, or marcs, the skins and seeds left in the fermenting tanks after the wine is transferred to casks to age. Unfortunately we have not found a different distilled liquor to be used instead grappa without changing completely the taste of bisciola. This cake is also made with buckwheat, a typical product of Valtellina valley. The buckwheat gives a very particular taste and makes this cake very delicious.